Unless you’ve traveled through Southeast Asia yourself, chances are you haven’t head much about Vang Vieng, a destination in northern central Laos. I hadn’t heard of it either, prior to researching for this trip, but soon it seemed like I was hearing the name Vang Vieng everywhere. Though Southeast Asia attracts tourists with a wide range of interests and intentions, there’s no denying that a large percentage of the travelers are young gap year backpackers, usually from Europe. These types of travelers are typically looking for the best places in the region to party, and in the mid-00’s, Vang Vieng became their destination of choice. It’s easy to see why the partiers congregated around Vang Vieng. 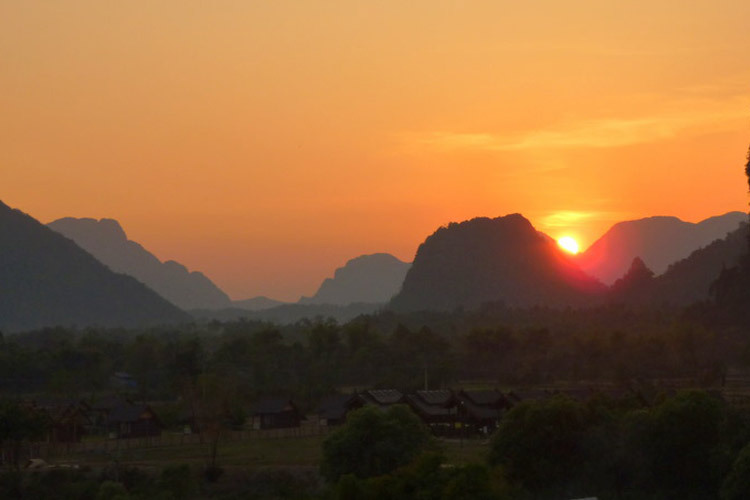 The town is conveniently placed between Vientiane and Luang Prabang, two of Laos’ most popular destinations. 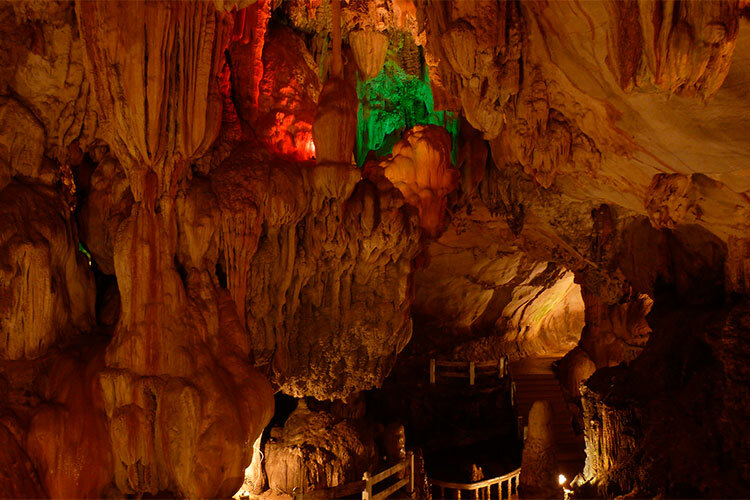 It has a beautiful landscape, flanked by mountains and limestone karsts on all sides. Most importantly, it sits on a powerful river. Tubing quickly became a popular activity, aided turn by the numerous floating bars that popped up along the river banks. The easy access to alcohol and other drugs turned a normally innocuous activity like tubing down a river into a dangerous activity. Every year, a handful of tourists would perish along the river, along with uncounted injuries. Then, in 2011, an astonishing 27 people died while tubing in Vang Vieng. Enough was enough, and the Laos government stepped in and shut down the party. All of the bars (except for a select few with connections to the police) where shut down. Drugs were no longer sold in the open. People no longer died. This history left Vang Vieng in a rather unique position. It had experienced one of the most rapid tourism booms in all of Southeast Asia, having gone from a small farming town to a party Mecca in just 5 or 6 years. Just as quickly as it rose, Vang Vieng’s tourism industry fell, as party goers were now turning their attention back to locations like Koh Phagnon. This left the town with dozens of empty hotels, bars, and restaurants, and not nearly enough travelers left to support these businesses. It’s at this point that ecotourism steps into the picture. 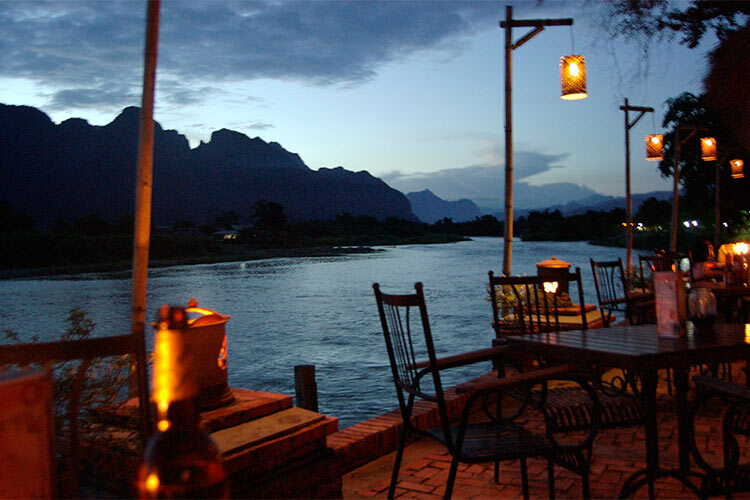 The business owners and community leaders of Vang Vieng have decided that the region’s utterly stunning surroundings should be the focus of their town, rather than partying. Since 2011, Vang Vieng has been on a relentless quest to reinvent itself as a paradise for outdoors sports and ecotourist offerings. In just four years, the town has already done a fantastic job of expanding its outdoor offerings. My recent trip to Vang Vieng was rather interesting. It hasn’t been quite enough time for the town to distance itself completely from its party image, which means there’s a few bumping clubs such as Sakura (if you’ve been to Southeast Asia, you’ve undoubtedly seen Sakura’s “Drink triple, see double, act single” tank tops they give away for free with each drink). Some restaurants still claim to sell drugs, though it’s by no means as universally available or as safe to consume drugs here as it was before. Most of the hotels seemed pretty empty, as well as the restaurants, even during high season. That said, the tour agencies are thriving. Dozens of guests are booking kayaking and boat tours, eager to see more of the Nam Song River than tubing lets you see. The tubing is still available as well, though it’s much more serene and tame than before. A handful of extreme outdoors options are also starting to pop up around Vang Vieng. Most notable is mountain biking and motorcross, which can be arranged cheaply at a number of shops around town. It appears that skydiving is also an option, as at least twice during my visit I spotted someone barreling into the nearby farms by parachute. One of the most spectacular (though somewhat expensive) ecotourist activities in the area is taking a hot air balloon. 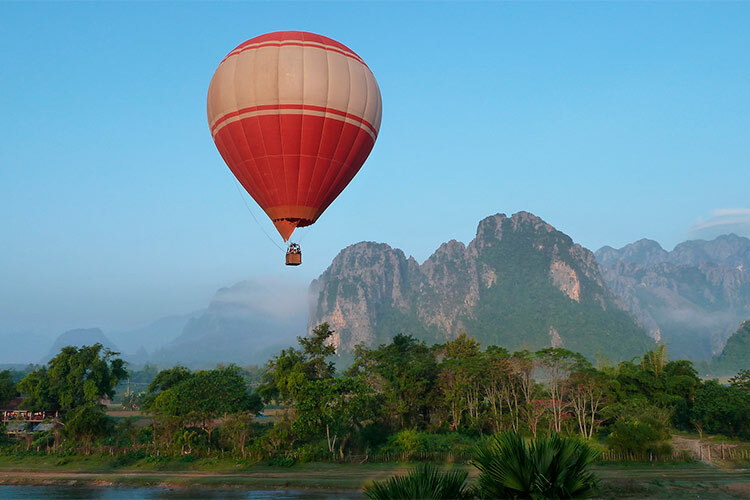 There are at least two or three balloons in Vang Vieng, which can be seen rising above the mountains towards the end of the afternoon to watch the sunset from the air. As of 2015, it costs $80 per person for a ride in a hot air balloon. Vang Vieng is the perfect example of how a town can reinvent itself and get in touch with its natural roots. 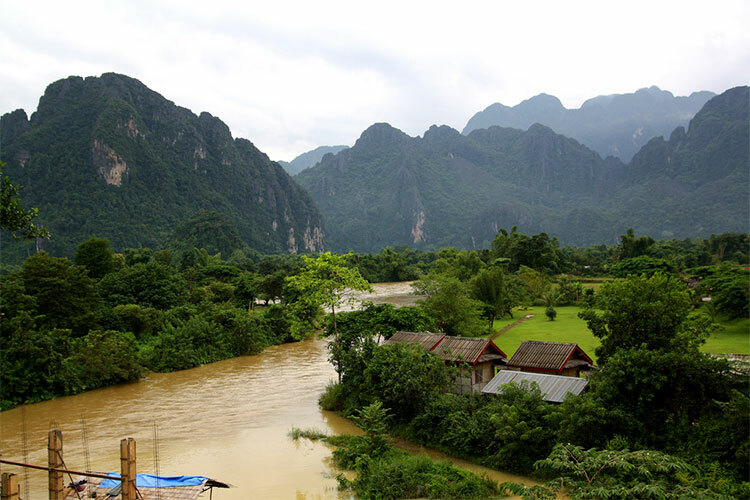 In a region that’s known for partying, it’s encouraging to see a town like Vang Vieng take a monetary hit and instead decide to focus on its natural surroundings. 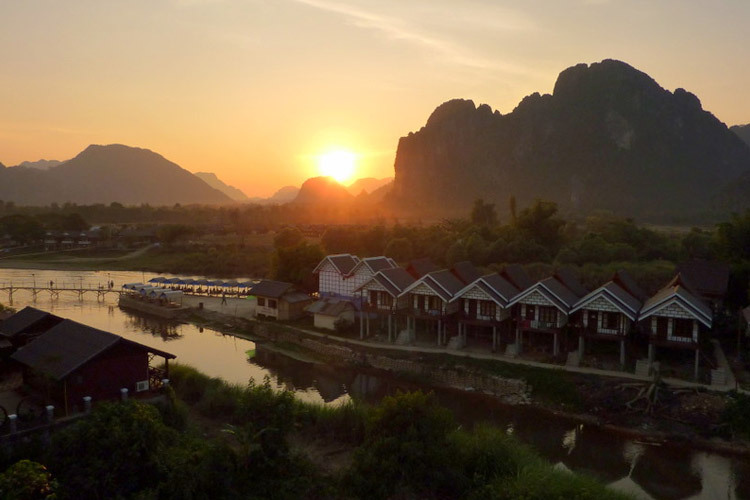 Hopefully Vang Vieng will be just the first of many towns in Southeast Asia that are able to reinvent themselves as prime ecotourism destinations.